With Dr. Dre confirming in a video selfie that Apple is about to make him the first hip-hop billionaire (give or take $200 million), it might be interesting to check out this video showing a video chat between Dre and the late Steve Jobs. 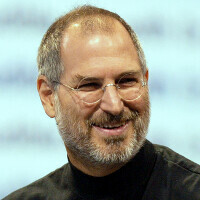 The late Apple co-founder had a strong affinity for the sound of the 60's as produced by Bob Dylan and the Beatles. When it came to rap, Jobs was not exactly a fan. The rumored Apple-Beats Audio deal is expected to be announced this week with Apple expected to pay $3.2 billion for the company. This would be the largest acquisition in Apple history. Getting back to the video, Dre talks about his latest album with Jobs inquiring about when it will be ready for iTunes. Dre also congratulates Jobs on the introduction of the iPod. We're not sure how the good Doctor felt abut hearing his music referred to as "stuff" by Jobs, but when the deal is announced this coming week, as expected, we know who will be having the last laugh. This is news..................................... that I saw on another phone blog...... 2 days ago. Nooooooooo lmao. Im watching it right now haha. At 22:32 lol. Oops sorry I hope I didn't spoil anything. Oh God I kinda did! Sorry man! Thought I'd help them out since I was the first one to click the article. Hi..I'm a fandroid. This is how my brain works. HTC adds beats audio to their phones = OMG..can't wait! Going to sound awesome! Apple adds beats audio to their phones = They are going to sound horrible..lulz!!! overrated POS. Lmao I know right. They'll do everything they can do to add distaste to Apple and their success that EVERY tech company envies. Haha very funny. Ex-owner of ipod nano and ipod touch here. Not every "fandroid" think in the same way. I am an android loyalist and I don't see myself going back to iOS anytime soon, mainly because of their stupid iTunes, but that doesn't make me an Apple hater, I always anticipate their products because in one way or another they always set a trend, whether it is the color choices, memory choices, their boxes, and revolutionizing the whole smartphone industry. I do hate their patent wars, because Apple does also copy from their competitors (notification bar and quick toggles for example) which I don't find it a bad thing to do, car manufacturers always do it and that leads to a better overall product for us the consumers. I think this year, with a bigger screen and a slight change in the design, the iPhone will set a new bar for others to reach and will break records in sales like the iP5 and iP4 did before. I don't know who you are but we think alike. I personally won't own an ios simply because no sd cards, iTunes and small screen size but I agree with you on this. Mr. Traitor i wasnt trolling at all. Beats were horrible from the start...it doesnt matter which company is using them....just an overhyped company that sells overpriced garbage. Nobody was excited about Beats on HTC. It sold so poorly that HTC dropped it. Even when the One had it, everyone commented about how crap the headphones and eq were. Yeah there are so many great equalizers in play store and much better than beats. Hi I'm a fandroid and this is how my brain works. 1. HTC adds beats audio = that may be cool 2. HTC creates the Rezound = Not worth the extra price, HTC marketshare drops below WP 3. HTC sells their stake in Beats because it was useless 4. Apple adds beats = it will be horrible. See, by skipping steps 2 and 3, you are able to easily tell your moronic story. Sadly, there is an actual history that led people who are actually thoughtful to getting to step 4. But, as an apple loyalists, I suppose you think people don't have steps 2 and 3 in order to create an informed opinion. You never saw "fandroids" bash notifications and command center for being horrible after Apple "adopted" them because they actually based their opinions on evidence. No "fandroid said apple adds notifications = horrible. Gotta love iTunes. In related news, Apple is the second largest online retailer behind Amazon now. http://youtu.be/TtuX5E-KZDc Thanks for the PA user who found this. PC Mag weighs in on 5 reasons for Apple not to buy Beats.http://www.pcmag.com/article2/0,2817,2457849,00.asp It's a needlessly dumb investment, even for an unfathomably well-moneyed company like Apple. Here's five reasons why: 1. There is nothing special about Beats hardware 2. Spotify is better and more popular than Beats Music 3. Apple already has iTunes 4. Fashion doesn't last 5. Controversial connection Behind #5 is the fact that Dre apparently beats up women.